« Homepage / Products I Like / "Mom Time With My New Omron Pocket Pedometer"
Weee! I have a new toy! My Omron Pocket Pedometer HJ-112 arrived on Monday and I have been spending my precious mom time with it eversince. My kids thought I got myself my own mom-size tamagotchi since I’ve been banned from playing with theirs. Now that I have a new toy, I am totally sooo over tamagotchis! I love that my pedometer is smart like me. You know what they say, birds of the same feather flock together! It’s actually called GOsmart: The pedometer with a brain. Nice! It has Accurate Smart Sensor Technology, meaning, the GOsmart Pocket Pedometer is more accurate than other pedometers that use a pendulum design. The 2D Smart Sensor, which is the brain inside it, knows exactly when you’re taking a step. It filters out non-walking movements so you know your step count is accurate. High tech! Ok, this thing is so light that it’s literally attached to me all day. It’s a constant reminder that I have to keep making those steps. 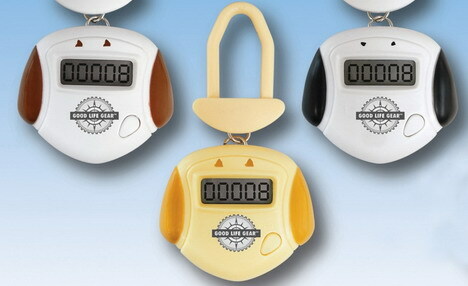 It’s helping me incorporate more physical activity into my day just by being aware of how many steps I’ve taken already. And if that’s not enough motivation, my husband keeps a tab on those counts and mocks me if I slack off. I know, he loves me too much! The clock automatically resets at midnight – so it’s always ready to go for a walk! Available at pharmacy retailers and online for $34.99. Oh by the way, thank you Momfluence for sending me this hot gadget! Here you can write a comment to the post "Mom Time With My New Omron Pocket Pedometer"